Let’s start with these perennial Paste-faves, who continue to stomp out the most spirited live set around. It’s old-fashioned, fire and brimstone revivalism for the folk crowd. With newly-recruited cellist Joe Kwon in tow, the boys stormed through tracks off of Emotionalism and their Second Gleam EP. They’ve been touring behind a lot of this material for what seems like forever, but all of that practice has allowed them to wring every drop of nuance from each song. Bobbing side to side in unison, the quartet had the audience enraptured from the first bars. They easily could have stolen the day with their afternoon set, but another force of nature was lined up right behind them on the schedule. Shimmying, strutting, stopping and starting on a dime, Jones and her eight-man funk squad turned in another triumphant festival performance at Monolith. With the Dap Kings providing a metronomic underpinning, Jones was free to run roughshod over the stage, showing off her brassy pipes and cutting loose more than a few times with some unhinged dance moves. stage. Appropriately, she wrapped things up with a James Brown medley, giving props to her idol and signifying her status as Soul Sister Number One. Here’s a group that thrives on expansiveness, on taking each big musical gut punch and exploiting it for all it’s worth. On the Red Rocks main stage, Band of Horses found the venue to match their sound, and the group's career highlights have never sounded bigger. Sporting a mile-wide grin across his trademark beard, leader Ben Bridwell's hollers echoed off the great stone formations and lingered in the air. Meanwhile, keyboardist Ryan Monroe became a bigger presence as the show went on, contributing spot-on harmony vocals and even singing lead on one of his own compositions. Look for Monroe to continue to mold the group's sound on their next release. Before they even took the stage, the men of TV on the Radio became the folk heroes of this year's Monolith Festival. An announcer hopped on the PA system just before the group's set and detailed the band's odyssey out to Red Rocks: first, the tour bus broke down in Salt Lake City. The members hopped a ride to Grand Junction, Colo., but still had to traverse the Rocky Mountains to make it to the festival. So they rented cars and drove as fast as they could to make it on time. That intense dedication showed in their set, which prominently featured tracks from their forthcoming album, Dear Science. "Golden Age" sounds like one of the most accessible things they've done: danceable, soaring, and unashamedly melodic. 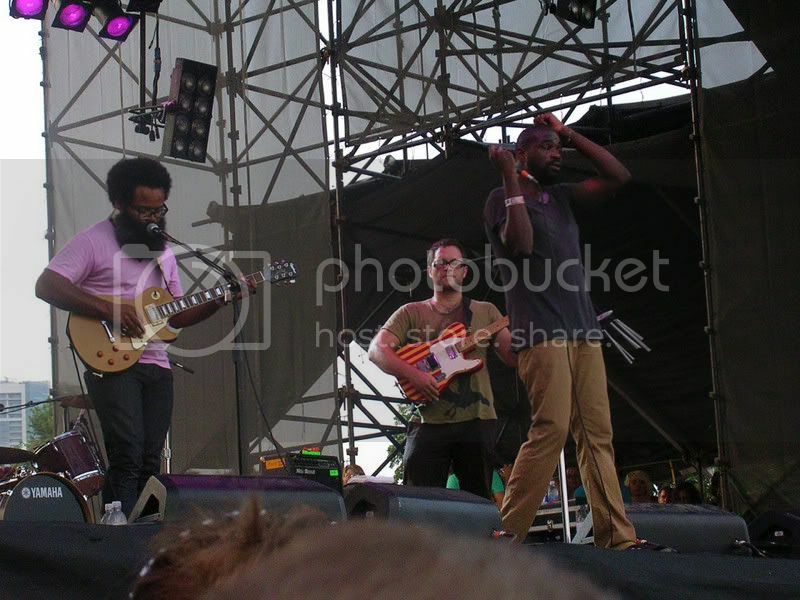 Singer/actor Tunde Adebimpe slid and seethed all over the playing field, while foil Kyp Malone (now afro-less) kept the other end of the stage steady. It seems a bit surreal to me that a group as high-concept as this one has captured such a devoted following, but TVOTR certainly looked like world beaters Sunday night. Now if David Sitek can just take those damn wind chimes off of his guitar, the band will have eradicated the bulk of the distracting pretension from its music. Unfortunately, that was it for me and Monolith. Work obligations pulled me out early, putting off an encounter with festival headliners Justice until another day. Given some of the accounts of their set, however, maybe missing out on this one was for the best. Check out Paste's photos from Day 2 of Monolith 2008 here.